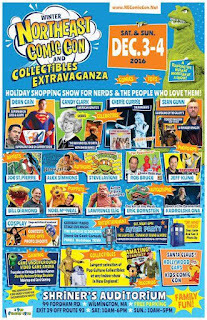 From the 3rd of December to the 4th of December, 2016, why don't you come on down to the Northeast Comic Con and Collectibles Extravaganza (Winter Edition), held at the prestigious Shriners Auditorium, Wilmington, Massachusetts, 10 miles north of Boston. It's one hell of a two-day event, and I'm sure nerds everywhere would love what they have on offer. For those who attend there will be plenty of things for you to get up to on each day of the con. So not only will you be able to shop with a number of comic book and geek related vendors (see below), but on top of that, you can also pop to a panel, change costume with a cosplayer, game with a gamer, chat with a creator, collect a collectible, buy a book, watch a wally, amass an autograph, party at the party, and gawp at a guest. Although, that said, not necessarily in that particular order. Dean Cain -- "Lois & Clark" & "Supergirl". Sean Gunn -- "Guardians of The Galaxy". Candy Clark -- "American Graffiti". Cherie Currie -- The Runaways. Jeff Kline -- Darby Pop Publishing. Joe Saint Pierre -- Spider-Man Artist. Alex Simmons -- Archie and Scooby Comics. Steve Lavigne -- Artist for Teenage Mutant Ninja Turtles. Lawrence Elig -- Sculpture of Star Wars & Universal Monster Action Figures. Mike Lopez and Gary Eckerson -- Creators of 'Life's A Beach'. Art Goes Pop / Wex Rex Collectibles / HB Comics / D.O.L.L. 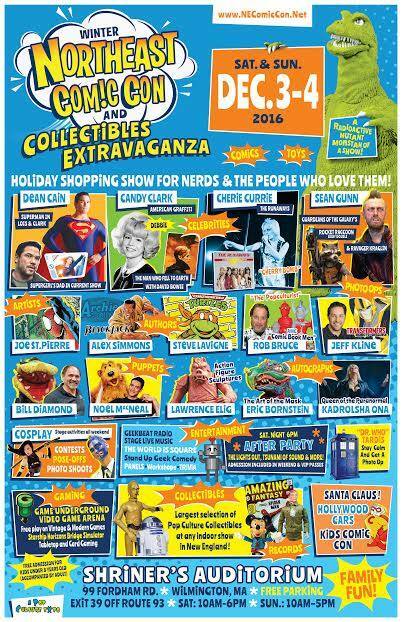 What: Northeast Comic Con and Collectibles Extravaganza (Winter Edition). When: It starts on the 3rd of December and ends on the 4th of December, 2016. Opening times are from 10am to 6pm for the Saturday, and 10am to 6pm for the Sunday. How much will it cost: For adults it's $40 for a weekend pass and $20 for a daily pass. For children, on the other hand, it will be $15 for a weekend pass and $10 for a daily pass. Parking and children under eight get in for free, and weekend passes include admission to the concert after party on the Saturday. VIP exclusives are also on offer. Please keep in mind that the box office opens at 8:30am each day, and for any more information, feel free to click on over to the official Northeast Comic Con and Collectibles Extravaganza website, facebook, and twitter pages.